Traveling with irritable bowel syndrome is a challenge, but if you plan ahead, you can manage your symptoms. Try these five tips. If you have irritable bowel syndrome (IBS), travel can present some not-so-fun challenges. Go by plane, and you may not be able to easily leave your seat. Go by car, and you may be at the mercy of the next rest stop. Travel stress and eating unfamiliar foods also can conspire to worsen IBS symptoms. It’s important to understand your condition and know how and when IBS affects you, Dr. Kirsh says. It’s also a good idea to get a handle on your condition before you travel. No one wants to leave town in the middle of a flare-up. If diarrhea is a possibility, have Imodium® or Lomotil® on hand. Pack laxatives if you could suffer from constipation. 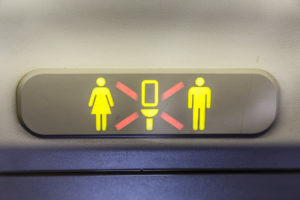 Get an app for your smartphone or tablet that helps locate bathrooms around the world, including free ones like Sit or Squat (the app designates clean bathrooms as “sit” and less-clean ones as “squat”) or Toilet Finder, which lists more than 70,000 public restrooms. When you’re prepared, that helps alleviate some of your worry. And, as you likely know, stress, in and of itself, can often exacerbate symptoms. For some people with IBS, food doesn’t cause problems. But if you are sensitive to certain foods, keep in mind that you’ll have less control of your food intake when you travel. Plan ahead and prepare to speak up when you need to. Pack snacks. Having something healthy at hand when you get hungry helps you avoid desperation eating. Be assertive when you eat out. If gluten or lactose is a problem for you, ask every time if they are in your meal. Or if you decide you want that bowl of ice cream, just know you may suffer the consequences later. Avoid caffeine. This can worsen symptoms. Limit dairy. Consume milk and other products with lactose sparingly. Amp up fiber. Be sure you are getting ample fiber in your diet to bulk up stools. Stay hydrated. Drink three or four glasses of water daily. Finally, if you are able to choose where you go, be mindful of your destination and its potential pitfalls. For example, you may want to avoid Mexico or a third-world country where food and water are problematic. Getting a stomach infection can cause IBS flare-ups, Dr. Kirsh says. Try not to set yourself up for trouble by planning trips where you’ll have to walk for long periods of time or travel frequently by train. You don’t have to stay home to manage your IBS. Think and plan ahead, and you can confidently open yourself up to a world of travel opportunities. Do You Know When to Visit the Hospital for Vomiting? Why Does Your Heartburn Always Seem Worse at Night? Did You Know Exercise Is Good for Your Eyes — and Your Vision?